Mobile pet grooming in Des Moines is our specialty at Denise's Doggie Do's. From the moment we pull into your driveway, your pet is going to be indulged in a relaxing, spa like experience. 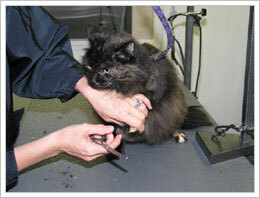 Our mobile pet grooming in Des Moines is unlike anything you or your pet has ever experienced. Once inside the all self-contained, climate controlled, state-of-the-art mobile salon, we begin the grooming process. Up on the grooming table we remove any excess ear hair and then clean the ears with a special, safe product. We then trim the toenails and grind them for a smoother finish. If your dog’s toenails have not been trimmed on a regular schedule, the quick has probably grown down the nail. When this happens we are only able to go to the point of where the quick is so as not to cause pain for your dog. To remedy this, your dog’s toenails need to be trimmed every couple weeks and over time the quick will recede. Walking them on concrete will also help. Next comes the warm, therapeutic, massaging bath. We use only the highest quality, all natural, biodegradable shampoos available, especially formulated for your pet’s skin condition and coat texture. If needed, a conditioning treatment with only the finest conditioners available follows the bath. A thorough rinsing of your pet and they are ready for the fluff dry. The dryers we use are made specially for dogs. Following the drying we brush and then comb your dogs coat, which prepares it for the styling of your choice. Bandanas and/or bows and cologne are the finishing touches we provide. Your dog will be prancing back to see you after this wonderful experience. We have not forgotten you cat lovers/owners. Denise’s Doggie Do’s Mobile Pet Grooming will take great care of all your grooming needs. Don’t worry about those stressful visits to the grooming salon where your cat has to hang out in a kennel all day with all those barking dogs around. Denise’s Doggie Do’s Mobile Pet Grooming provides a peaceful, stress-free environment in the comfort of your cats home surroundings to trim toenails, bathe, give a light trim or a shave, comb out or whatever your cat’s grooming needs are. All the shampoos we use for cats are of the highest quality, all natural, biodegradable and specially formulated for cats. We all need less stress in our lives; Denise’s Doggie Do’s Mobile Pet Grooming believes pets deserve that too. Whether you need our mobile pet grooming in Des Moines, or the surrounding areas, Denise’s Doggie Do’s Mobile Pet Grooming can do it for you. To book an appointment with Denise's Doggie Do's Mobile Pet Grooming in Des Moines and surrounding areas, call 515-289-4469 or fill out the form on the contact page.